Controversial plans for a £700m regeneration of Preston city centre have been backed by councillors. 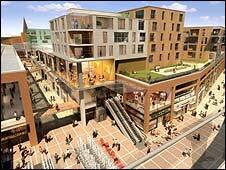 The Tithebarn scheme plans include large-scale demolition and re-building work, creating a John Lewis store, a new bus station and a revamped market. Neighbouring councils Blackburn and Blackpool have voiced opposition to it, claiming it would destroy the economies in their towns. Preston councillors agreed planning permission after a two-day debate. Council officials say that the whole of north-west England will benefit from the development. Now the plans will be put forward for government consent. Blackburn and Blackpool Council had previously said they may call for a public inquiry if the project is given planning permission. Councillor Ken Hudson, leader of Preston City Council, said he was "pleased" with the planning committee decision. "It took into account all the representations which were submitted following consultation," he said. "It is vital for the regional economy that Tithebarn is allowed to proceed, especially in the current economic climate. "We hope the government is persuaded by the very clear arguments in favour of Tithebarn and allows the development to go-ahead, without the need for a costly and un-necessary public inquiry which could potentially put the whole development at risk." The proposals for Tithebarn are being led by Preston Tithebarn Partnership which includes developers Grosvenor and Lend Lease, as well as Preston City Council.